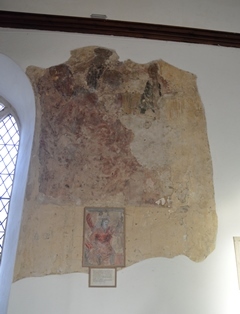 The church was tucked back behind the houses, and a delightful surprise awaited me. 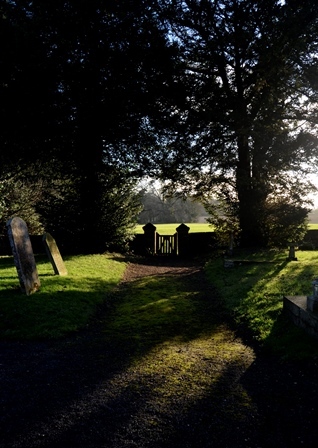 When I entered the churchyard, I wondered why there was an electric fence right beside the path, which made me feel slightly cramped, nervous of getting too close with my cello. But as soon as I saw why the fence was there, my attitude changed completely: amongst the gravestones were about five or six curly sheep. They looked extremely snug in their thick coats, not to mention extremely cuddly. They soon came to say hello, and I wondered if the church was planning on staging an authentic nativity scene this Christmas. I don’t know why the sheep were there, but seeing them instantly brought to mind my indignance at Pettaugh church, where a sign stated that weedkiller was used around gravestones to avoid damaging them with a strimmer, as well as to kill ragwort in the churchyard – which is as nonsensical an argument as I can think of, given that there were no grazing animals present. In any case, animals are not stupid: as long as there is enough else to eat, they will avoid the ragwort. It is common to find cattle and horses grazing in fields with a few ragwort plants dotted about. Here was the solution to strimmer damage, I thought; and yet, it was the first churchyard in which I had encountered grazing animals. 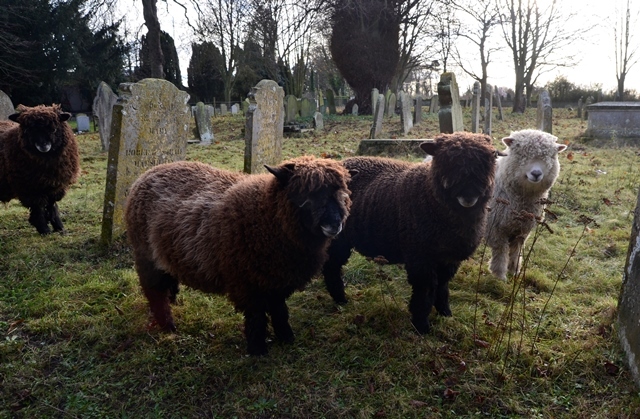 Perhaps I should start a campaign called ‘Sheep for Churchyards’. 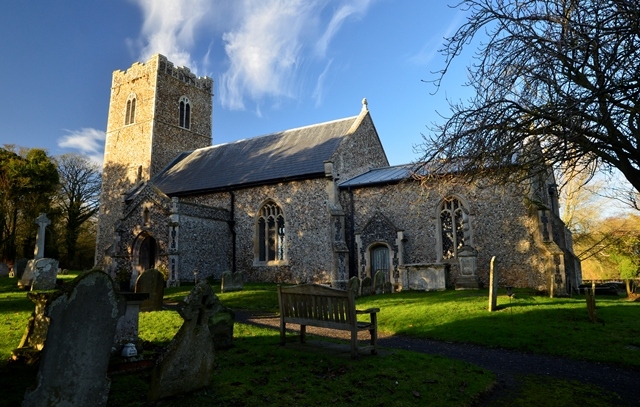 The church could raise a little money from the rental of its land for grazing, instead of paying for a gardener to come and strim it, and weedkiller could be made definitively inexcusable. 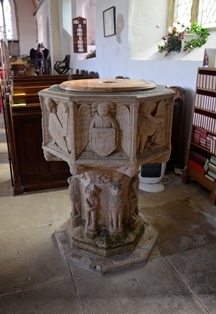 If sheep were put in the areas of churchyards with older gravestones – as at Middleton – where there are no flowers planted or left beside graves, I don’t think any offence could be taken at their presence. (The idea of taking offence at curly sheep seems a little ridiculous to me, but you can be sure there will always be someone available close at hand to do so.) Often these areas are designated as wildflower meadows anyway, which benefit from grazing from September to March. 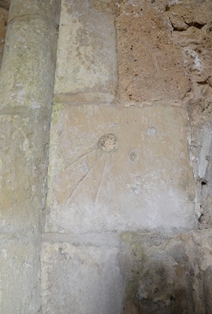 I was pleased with the exterior of Middleton church for another reason: it had a cockerel on its spire. 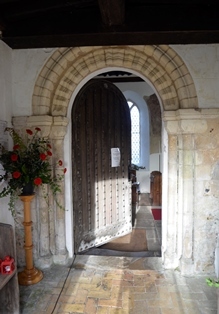 The concrete porch front was not so pleasing, and the Norman doorway in the porch even less so, due to its rather baffling decapitation by the timber for the porch roof. 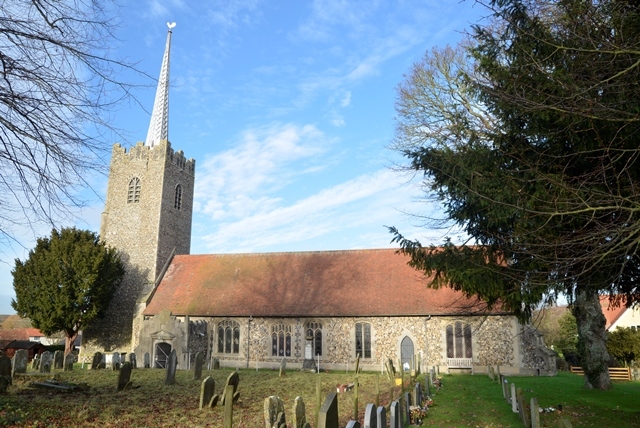 After examining the roof, I concluded that – rather like using weedkiller in churchyards – there was no excuse for this act of vandalism, which could easily have been avoided, had the people in question cared a little more. 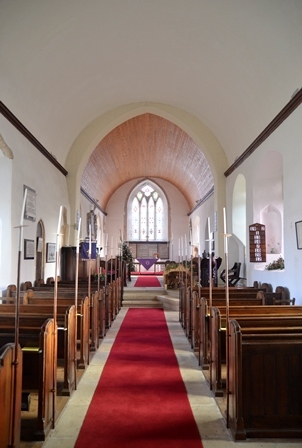 The interior of the church was lovely and bright, and, as I was rather foolishly coming to take for granted, had a good acoustic. Strangely, I didn’t feel nearly as cold as the previous day, even though the temperature was approximately the same. But for the first time I could properly see my breath, for no reason that temperature or humidity readings could shed light on. 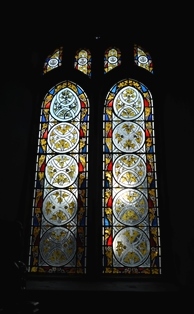 After enjoying the font, wall paintings and stained glass window based on a leaf design, and struggling to tear myself away from the curly sheep, I eventually made it back to the car. 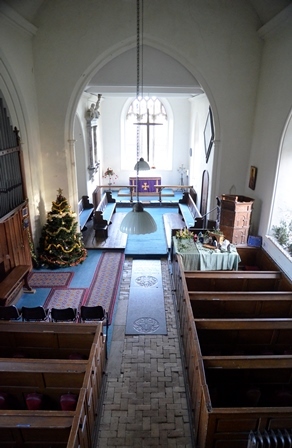 Benhall was nearly as endearing as Middleton, despite being cut off from its village by the A12. 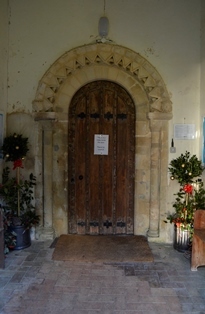 Not because it had sheep, but because of its unusual design of Norman doorway (not vandalised this time), brick floor and knitted nativity scene. Something else attracted my attention, whose meaning I couldn’t interpret: a floor memorial that looked as though it had first been dated 1702, and then changed to 1672. Or possibly the other way round, but the ‘67’ was engraved more heavily and gave the impression of being the amendment rather than the original. 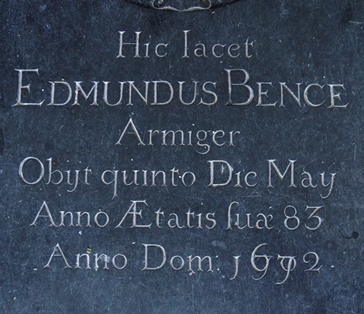 Not having studied Latin was might have been a hindrance to my interpretation of this strange phenomenon; however, I am not entirely sure that the story of this memorial date would have been any more obvious to the ignorant visitor if it had been in English. Concluding my few days’ practice here was a pleasure. I packed up, satisfied that I had done enough work on both the pieces I needed to brush up, and the pieces I wanted to learn, as well as having had a thoroughly relaxing and enjoyable holiday. 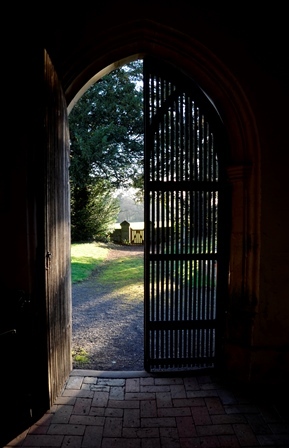 I opened the door to a beautiful sunlit scene, and stopped to appreciate the gift before turning my mind, and my footsteps, homewards to more practical matters. On the penultimate day of 2018, Steve and I arranged a morning church visit. I was pleased to fit in one more before the New Year: it felt right to see out the year in this fashion. However, it was a Sunday morning, and I had forgotten to do any research about church service times and locations. Steve had been more organised than me, and we deduced from his findings that Holbrook would have a service on this morning. So we opted for Freston. Sadly, it was locked, and we got no answer when we phoned the keyholder. 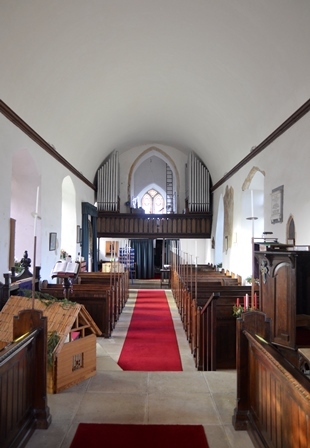 I was feeling ambivalent: both apprehensive about disturbing anyone on a Sunday morning at this time of year, and therefore slightly relieved not to get an answer, but also unwilling to drive all the way home again without having played in a church. Time was short, as I was due at my neighbours’ house for lunch. 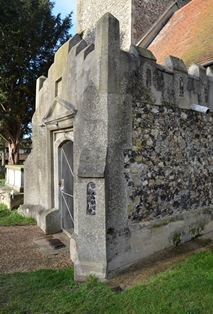 We continued to Wherstead, which was the next closest church. This, too, was locked, and I was starting to lose hope. But we got lucky on the second phone call: thankfully, a friendly man answered and said he’d come up to the church and unlock it for us. I offered to pick up the key, but he didn’t want to lend it, so I just said, ‘my friend and I were hoping to play some music inside, if that’s ok’. After consenting, he added, ‘that’s not the strangest thing I’ve been asked if someone could do in the church’. ‘We’re not dodgy, I promise!’ I replied, laughing. While we waited for him to arrive, we looked around the churchyard, from which there was a view of the Orwell estuary, as well as the not-so-lovely Orwell Bridge. The noise from the A14 was considerable. 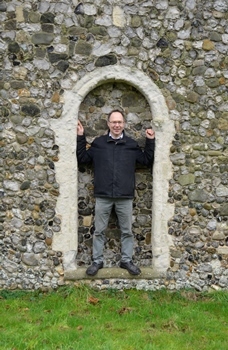 We also discovered a Norman doorway on the north side of the church, in which Steve suggested I pose for a photo, but I managed to persuade him to do so in my place. It wasn’t going to be a relaxed visit, as we were anxious not to keep the keyholder waiting for too long, and in any case I’d already had to phone my neighbours to ask if I could arrive half and hour later than the appointed time at their house. The keyholder was good natured and not only turned on the lights for us, but also the heaters. I was armed with my new fingerless mittens, which were a resounding success: My fingers warmed up very quickly, with the additional help of several fleeces and a scarf, whereas poor Steve was freezing in his thin jacket. I did offer him my second pair of mittens (both given as Christmas presents) but, inexplicably, he declined. We played Telemann, Mozart and Couperin, and then judged that we should pack up. 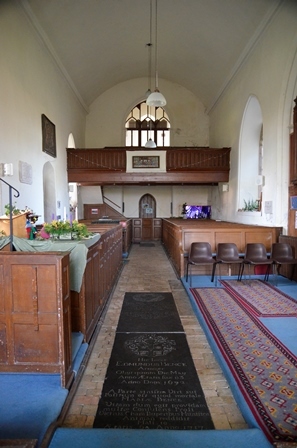 So as not to keep him waiting any longer, I decided to take interior photos on another occasion: Steve, it turned out, knew the benefice administrator mentioned on the keyholder notice, and thought he’d be able to borrow several keys at once if we arranged our next visits in advance. 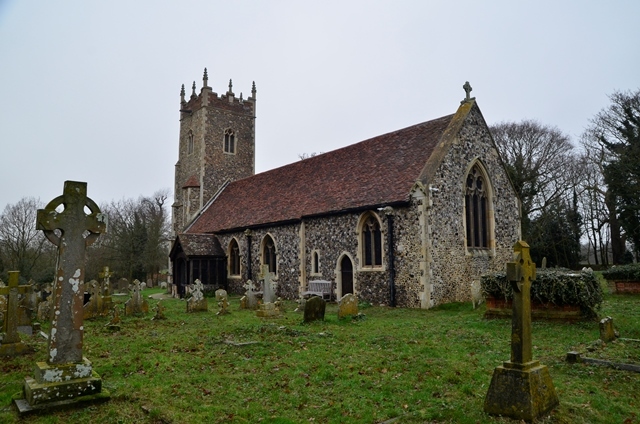 A bonus of our morning’s church-search was that I’d had a little tour of the Shotley peninsula: I hadn’t realised it was quite so small. We’d crossed it to reach Wherstead, only a short way down a concrete track from the Suffolk Food Hall, I discovered, which I had visited with my friend Simon on the day of my first Shotley peninsula outing. I had thought Freston was the closest church to the Orwell Bridge. The other surprise was the hilly nature of the peninsula, and how many beautiful views are to be enjoyed there. I dropped Steve back at his house, and headed home, already looking forward to our next outing in 2019.